With the massive east coast snow storm that just blew through there can be signs of leaks that have never before been seen. These leaks are most likely a result of roof ice dams. What are ice dams you ask? When there is a buildup of snow and ice in the gutters along the eves of a home water can no longer drain. As the snow and/or ice melts above the gutters it hits the ice dam, freezes and continues to build. As this water backs up it can enter under the first several courses of shingles and the leaks begin. 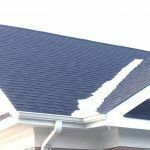 There are a few causes of this and many times there are not due to poor roof installation. It’s a simple matter of heat transfer that causes the melting of the upper snow. That heat is due to poorly insulated attic spaces or even heat loss in nooks and crannies that are not properly sealed off in the home. There are some preventative measures that can help. The first is to keep as much of the snow and ice off of your home and gutters as possible as it builds. This can be dangerous given the steeper the roof so it is never recommended for non-professionals. Second, make sure your attic is properly sealed and insulated. The eves are rarely insulated. So, as the melt runs to those areas it will quickly re-freeze. Therefore the water backs up higher and higher until a leak occurs. Third, when you are in an area that encounters more and more snowfall it is usually code to have an “ice and water shield” product installed along the eves. However, in the southeastern region of the US it is not below the Virginia boarder. Consult with your local and certified roofing professional to see what is offered and if it is worth the investment to have this product installed along your eves. Given the linear feet your home has, the cost of the product along with ice and snow storms once every few years, it may or may not be worth it. However, it’s always worth the discussion when re-roofing your home.